We shall go into the house of the Lord…. I have sought good things for thee. – Psalm 121. LINCOLN, Nebr. – About ten years ago, the Newman Center at University of Nebraska-Lincoln (UNL) began facing up to a big problem that had been growing bigger each school year. As part of the network of Newman apostolates around the country, the Catholic Cornhusker outreach on UN-L’s campus had a sterling reputation for drawing in students, Catholics and non-Catholics alike. Young people plugging into the UN-L Newman Center’s catechetical, liturgical and spiritual programs come to learn more about the Catholic faith, revitalize their relationship with Christ through access to the sacraments, public prayer and private devotions, and graduate from UN-L, a 25,000-student institution, with a keen sense of how to live out their baptismal call to holiness – whether through the Catholic priesthood, consecrated life or married life. But the Newman Center seemed to be doing its job only too well under the leadership of its two pastors, the late Monsignor Leonard Kalin and, for the past 17 years, Father Robert Matya. Apparently the church which served as the spiritual home for Catholics on campus was getting too small for the droves of students attending Sunday Mass. Every nook and cranny of space was being occupied at each of the several celebrations of Mass each weekend. This phrase became such a byword at the UN-L Newman Center that they eventually integrated it into their solution – the newly built St. Thomas Aquinas Church and Newman Center complex. Dedicated earlier this year on Divine Mercy Sunday, April 12, by Bishop James D. Conley, Bishop of the Diocese of Lincoln, the new church replaces the older, smaller structure built in the 1960s. More than doubling the capacity of the older structure, the new building seats at least 650 people comfortably – with plenty of extra seating for another 100 or so people. Designed and built by a team of architects and architectural experts who specialize in classical and ecclesial building design, the 60,000 square foot facility includes the church, a student center, parish social hall, rectory and office suites. The team included Kevin Clark of Clark Architectural Collaborative3, Lincoln; Denis McNamara, associate director of the Liturgical Institute of Mundelein Seminary, Illinois, who provided many contributions to the design of the building as an expert in classical and ecclesial architecture; and James McCrery of McCrery Architects, Washington, D.C., who, with other architects around the country such as Duncan Stroik and Thomas Gordon Smith, is leading a revival in classical architecture. A melding of classic architectural design and modern state of the art heating and cooling through an extensive geothermal system, the church boasts a 122- foot bell tower with a spacious interior, a 70-foot high crossing tower and almost 50-foot tall interior coffered ceiling. Perhaps the best evidence of the Lincoln Newman Center’s overachievement was the massive Mass attendance on campus: students show up to participate in liturgical celebrations in incredible numbers. But the old St. Thomas Aquinas Chapel only seated 300 people at a stretch, Father Matya said, and “standing room only” had become the new norm for Sunday Mass. About eight years ago, Father Matya said, it was time for the Center to start thinking about ways to accommodate the overflow – which led to the inevitable talk about a building project. But where are university students going to come up with money for any sort of expansion effort? Further complicating the situation, the UN-L Newman Center, located near the center of campus, is locked into its location. The block-and-a-half area occupied by the Center left little room to build. And so, Father Matya and the rest of the Newman Center staff realized something had to give. That something was the Diocese of Lincoln, a trio of important architectural experts, and a group of committed benefactors giving the go-ahead to build a new St. Thomas Aquinas Church – what Father Matya sees as the diocese’s legacy to future UN-L students. Originally, the plan was to renovate, Father Matya said, but the response from the diocese was an unexpected surprise. When we went to the diocesan building commission, they rejected [the renovation] plan and said that we ought not to be putting that kind of money into renovating the current building,” Father Matya relates. “Instead, they said, ‘Why don’t you knock it down and start over?’…So we went back to square one. Like the architects involved in the project, Bishop Conley also has a keen appreciation and understanding of the classical tradition. A 1977 graduate of the University of Kansas, Bishop Conley, like his fellow KU alumnus Archbishop Paul S. Coakley (Archdiocese of Oklahoma City), participated in the renowned but short-lived (1970-1979) Pearson Integrated Humanities Program started by a trio of KU professors – Shakespeare scholar Dennis Quinn and classicists John Senior and Frank Nelick. Because the program focused on the great literary works of Western Civilization, it should come as no surprise that Bishop Conley understands the power of the new church’s design. Even before the newly built church was dedicated, Bishop Conley said, it has “been the buzz of the city,” having become a prominent feature on Lincoln’s skyline – with only one other “temple” on campus standing taller – the UN-L football stadium. Besides being a jewel in the diocesan crown of churches, Bishop Conley said that the new brick and mortar project for Newman also includes social and academic components – a Catholic fraternity for men, which was established with a residence on campus, two years ago, and a Catholic sorority for women, both in the Greek system. Bishop Conley said that the Newman Center is also planning to open the Newman Institute for Catholic Thought and Culture, offering a program of integrated humanities studies. The program will begin with a pilot lecture series in Fall 2015 with the first series of courses to be offered Fall 2016. With both a professional and personal connection to the building project, architect Kevin Clark was a Newman Center student at UN-L in the 1990s and as an experienced architect took the helm on the new church and complex project. But Clark’s connection to the Newman center, he said, goes back long before matriculation as a Cornhusker. 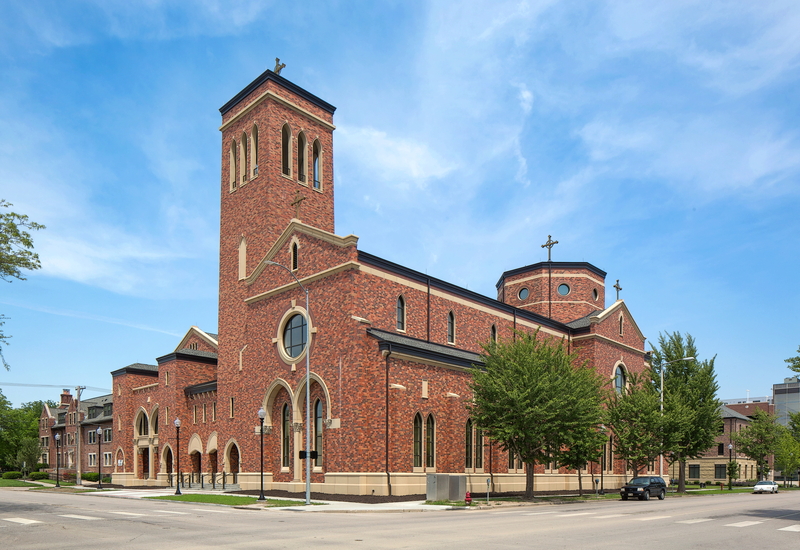 Besides expertise and knowledge, Clark was also the likely choice because of his work for the diocese designing and building St. Gregory the Great Seminary, Seward, Nebr., in 2000 – but the Newman chapel was a whole new challenge for architect and patron alike. Thanks to the teamwork of Clark, McCrery, McNamara and Father Matya though, the challenges were met – and expectations exceeded. The project also incorporated elements of a salvage operation, Clark said, by acquiring a collection of liturgical antiquities from closed churches, including a pipe organ rescued and restored from neighboring Cornerstone Methodist Church, Lincoln, and a pair of altars rescued from the now-closed Immaculate Conception Church, Youngstown, Ohio, and repurposed as St. Thomas’s altar of reservation and altar for the church’s Marian chapel. Marian chapel. Since its official dedication, Clark said, he’s been reminded of the impact that UN-L Newman Center has had on his life by seeing all the students from surrounding Catholic schools visiting the church. As part of the design process, a meeting was held between the architects, the planning committee and Newman students. At one point, said Clark, the meeting began to look less like an architectural discussion and more like a rock concert, as students began to hold their digital devices high in the air like cigarette lighters. One student-inspired detail in the new church, Father Matya said, that has drawn comments has been the Communion rail at the entrance to the sanctuary which is employed in all Masses at the church. The church is also informed by a proper Catholic anthropology, Father Matya said, a perspective its designers understood well. Another reaction that people have had to the building, Father Matya said, is a sort of cultural shock and awe. 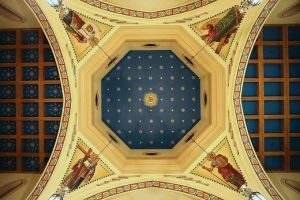 While the beauty and liturgical components of St. Thomas Aquinas Church are impressive, McNamara said, it was equally impressive that the project began at all. Inherent to its architectural DNA, McNamara said, a well-designed Catholic church serves as an archetypal image of the eschatological vision in sacramental terms – culminating, in St. Thomas’s case, in the heavenly vision of Christ on his throne provided in the stained glass window in the sanctuary. Whether expressed in word, image, sound or other media, McNamara said, the Church’s tradition is the anchor of the faith. Acknowledging that he’s inherited a strong and effective Newman ministry from his predecessor Monsignor Kalin, Father Matya said that now as then students are hungry for the truth. Because of the many points of interest – architectural, historical and spiritual – Clark sees St. Thomas Aquinas Church as the herald for a revival in Church architecture. There are still stained glass windows and other items yet to be funded in the church and a financial debt of several million dollars to be paid down on the $25 million project. But benefactors remain generous – even current students have pledged almost $300,000 to the project. With this momentum behind the project, Father Matya is grateful that the Catholic faith has a secure future on UN-L campus. “In the crossing tower there are triangular shaped spaces called pendentives [a series of four constructive devices which allow a circular dome to be placed over a square room or elliptical dome over a rectangular room]. Normally, churches that have pendentives would have the four gospel writers depicted in the spaces because there are four of them. But since we already have Matthew, Mark, Luke and John in the stained glass window in the sanctuary, and the bells in the bell tower are all named after the four evangelists, we thought we might want to do something different. There are statues of four saints who surround the main altar of St. Peter in Rome, each statue the work of Italian sculptor Giovanni Bernini (1598-1680). The pendentives in St. Thomas Aquinas Church are painted versions of the statues of St. Helen [mother of Emperor Constantine who found the true cross], St. Veronica [who received the gift of Christ’s image on her veil after she comforted him along the Via Crucis], St. Longinus [who pierced Christ’s side with the lance and at the moment of Christ’s death testified that the man on the cross is the Son of God], and St. Andrew [the first of the Apostles chosen by Christ]). People come in and ask, ‘Who are those saints? Tell us about them.’ It invites visitors into more of the story of our faith. They’re intrigued by it. Who was St. Helen? They don’t know these stories and when they hear them they’re edified by them, because they’re beautiful. – Father Matya, Chaplain, St. Thomas Aquinas Newman Center, University of Nebraska, (Diocese of Lincoln). – Bishop James D. Conley, Bishop of the Diocese of Lincoln. – Denis McNamara, Associate Director, Liturgical Institute at Mundelein Seminary, Chicago. – Kevin Clark, Architect, Clark Architectural Collaborative3.